Retinyl Linoleate (>80%). 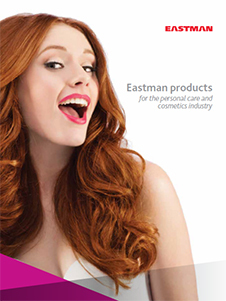 Eastman GEM™ Retinyl Linoleate by Eastman is a high purity anti-aging agent. It is prepared using GEM™ technology, which significantly reduces energy, carbon dioxide emissions, waste, and water usage. It has a low E factor of 6.0. 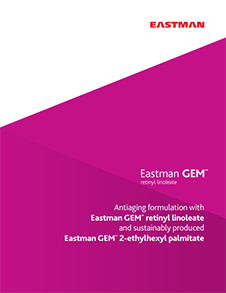 Eastman GEM™ Retinyl Linoleate finds application in formulating anti-aging preparations, hand wash, facial cleansing, facial treatment, foundation, hand cream, lip balm and lipsticks. Please note, these HSP values are estimations. It is based upon the “like seeks like” principle. It splits an ingredients interactions into three parameters; δD (Dispersion force interactions), δP (Polar forces interactions) and δH (Hydrogen bond force interactions). 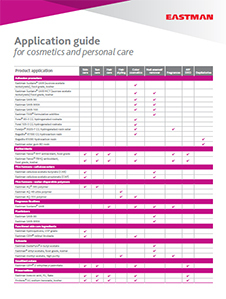 Hansen Solubility Parameters can help you find a wide range of products that are predicted to be compatible with Eastman GEM™ Retinyl Linoleate. A practical determination of these HSP values would provide higher certainty. Learn More.